Nature and magnitude of environmental impact that resulted from these practices. At first glance, this seemed to me to be a relatively straight-forward study, however, it quickly became apparent that the answers were illusive and not forthcoming. Several methods were employed to determine the answers, including an extensive telephone survey of horse owners, a windshield survey in known horse communities, and direct sampling and laboratory testing of manure piles where permission to access the pile was (seldom) granted. In the end, the results were very fuzzy with an estimated 30,000 horses in scattered areas throughout the county, mostly bedded on shavings (with a growing awareness of wood pellets as an alternative) and with manure mostly "piled out back". While the environmental impact was difficult to measure, it became clear that virtually every watershed in the county was adversely impacted by nutrients originating on horse farms (i.e. non-point source pollution). This study brought to my attention a critical need in the equine community, and from this was borne the early concept for the O2Compost Training Program. The Training Program took roughly 10 years to conceive, develop, test and refine, and many people were directly and indirectly involved in this process. Historically, the O2Compost Training Program has been conducted remotely on a one-on-one basis. Now we are pursuing our vision to conduct group training programs at host facilities around the country. What brings all of this to mind is a study conducted by the American Horse Council that estimates the total number of horses in the United States to be approximately 9.2 million. How this number was determined is anyone's guess, but let's - for the purpose of this discussion - assume that it is reasonably accurate. Given that one horse produces roughly one cubic yard of manure each and every month, it stands to reason that the total volume of manure produced in the United States is on the order of 9 million cubic yards per month. And this does not include the volume of bedding which can easily double or triple the total volume of manure depending on the type of bedding used. Aside: For those not familiar with the "cubic yard" as a unit of measure, it is equal to a cube that is 3 feet wide by 3 feet long and 3 feet high. One cubic yard equals 27 cubic feet. A standard pickup truck will hold 2 cubic yards if mounded. 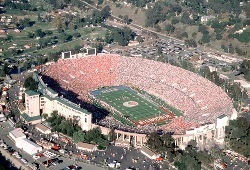 Now, I find a volume of 9 million cubic yards hard to imagine in real terms, so I did some research and learned that the Rose Bowl in Pasadena, California, would hold over 84 million gallons of water if filled to the brim. Given that there are approximately 200 gallons in a cubic yard, you could fill the Rose Bowl roughly 22 times with horse manure each month, or 265 times a year. Another way to look at this: if a year's worth of horse manure were to be stacked vertically on a football field, from end zone to end zone and sideline to sideline, the pile would stand 10 miles high - that's higher than commercial airliners fly. Now I think you'll agree, that's a LOT of manure. Add to that the amount of bedding used and you can begin to see the order of magnitude of the problem - or opportunity - that we face. This volume of manure also represents a tremendous quantity of nutrients that can either be mismanaged and allowed to impact our fresh water resources and aquatic wildlife, or properly managed and utilized in a wide array of applications that help heal the earth. Each of us impacts the world we live in, either negatively or positively. This is especially true for those of us who own horses and other livestock. Properly managing horse manure is our responsibility! The impact from horse manure can be negative if we disregard our responsibilities to the earth. Alternatively, the impact can be positive and financially rewarding if we view manure as a resource and an opportunity. Composting is easy when you know what you are doing and with the O2Compost Training Program, your success is guaranteed. Composting, in my opinion, is the most effective and profitable means to properly manage horse manure, to support sustainable agriculture, and to leave the world a better place for the generations that will follow ours. I invite you to begin composting - to be a part of the solution.